Solar Energy Desalination Technology explains how to obtain clean water from sea water using solar energy. 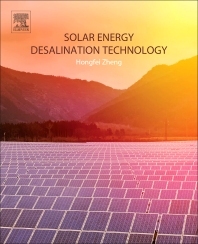 Special methods and types used in solar desalination are introduced, providing new thoughts, concepts, and feasible solutions in the desalination field, along with the thermal and economic efficiency relating to current technology. Many places in the world are suffering from fresh water shortage. However, those places are often rich with solar resources, sea water, and/or brackish water resources that could dramatically benefit from solar energy as a viable solution for the production of fresh water. Professor Hongfei Zheng has been carrying out research in the area of renewable Energy and Energy Efficient Systems in the past twenty years. He has a wide range of experience in solar energy applications including hot water, desalination, air conditioning, solar concentration and daylighting. He began his research interest in solar energy applications since he was a lecturer at Guangxi University in 1980s. Professor Zheng started his PhD study at the University of Science and Technology of China in 1996. Since completion of PhD in 1999, he had worked in Xian Jiaotong University for two years as a postdoctoral researcher and associate professor. During that time he completed independently a research project funded by the Postdoctoral Management Committee of China, in 2002, Professor Zheng has been working at Bejing Institute of Technology. His research has mainly been focused on 1) solar desalination, 2) solar concentration and 3) solar daylight guiding. Professor Zheng has published more than 180 peer refereed papers and 5 monographs. He has obtained 20 patents. He worked in Nottingham University in UK as a visiting professor in 2012 and 2013. During this period he completed the European Commission for a Marie Curie Fellowship grant (PIIF-GA-2010-275038). He is the principal investigator for 5 important research projects respectively funded by the National Natural Science Foundation of China (Nos. 50576004, 51076016, and U1261119) and National “863”Hi-Tech Development Program of China (Nos. 2007AA05Z433, and 2013AA102407-2).